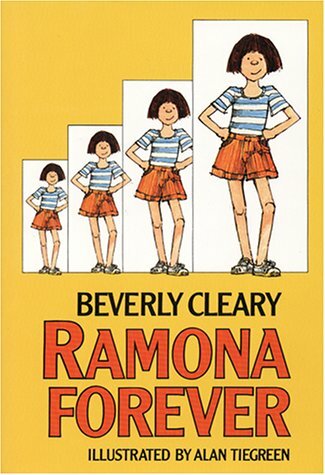 I remember liking and relating to the Ramona books by Beverly Cleary when I was an elementary aged girl. I decided this summer that it was time to introduce Ramona to my children. I wanted to make sure they discovered her first via the books before they discovered her in a movie. If you haven't heard, they are about to release a movie entitled Beezus and Ramona. You can watch the trailer here. I think I'll be disappointed in the movie because it seems like they are making Ramona out to be a little too cute, a little to mischievous, a little too "Disney". I've been reading Ramona Forever chapter by chapter to D'arcy and Julian, and I'm reminded of all the things I love about this character. She's not beautiful. She's a little sassy. She worries about both trivial things and important things. She wants her mom and dad to be happy. She's independent, but still needs reassurance and support. She's occasionally willing to admit these needs. She's ordinary, and the situations she encounters are ordinary. She makes mistakes, but she is learning about herself and others. She's growing up. Julian liked the chapter about burying the dead cat named picky-picky. D'arcy is looking forward to details of the new baby that will enter the Quimby house. They both enjoy the illustrations that are sprinkled throughout the book. Ramona might not be the perfect child you want your kids to become, but she just might be a character that your kids relate to and that reminds you of how tough growing up can be.